PLEASE READ BEFORE PURCHASING UZOOM Please don't confuse UZOOM with all other models of Adlens glasses sold by resellers on Amazon. The purpose of those glasses are NOT the same as UZOOM. If you need READING GLASSES you want Adlens UZOOM - which are adjustable-focus reading glasses and only allow for clear vision for up-close tasks ONLY. 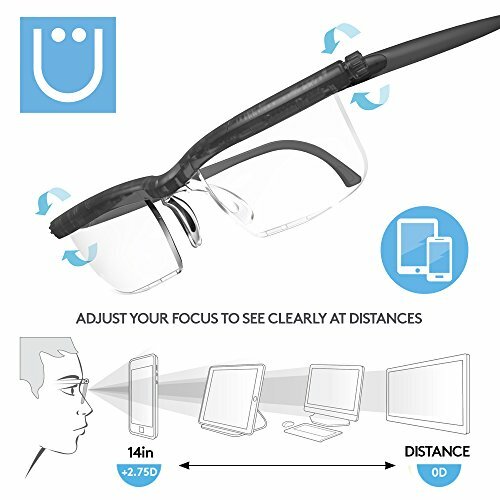 UZOOM are identified by lenses having a full field of view and are only available directly from Adlens. If you desire an alternative to prescription eyewear, you will want our older models called Adlens Adjustables, Interface, Sundials, and Emergensee which fall into the replacement glasses for prescription eyewear users category and correct for distance and near vision and are identified by the oval viewing window in the center of the lenses. We want happy customers so this distinction between the old Adlens products and the New UZOOM products is very important for when deciding on purchasing - Remember UZOOM are Reading Glasses and all other Adlens Adjustable products are prescription eyewear alternatives. Adlens representatives are always available to assist in finding the right product for you, just visit our site or reach out through Amazon. Fine tune the Focus from 14" or 0.0 to +2.75 that's equal to 10 different pairs of reading glasses! If you have any questions about this product by UZOOM, contact us by completing and submitting the form below. If you are looking for a specif part number, please include it with your message.